SPORA. I International Exhibition of Ephemeral Art, Tradition and Modernity concerns the dissemination of contemporary art projects in the city of Granada following a pre-established itinerary, which proposes to merge Tradition and Modernity, joining two sides of the city for that purpose: Sacromonte and the area of the Museums Parque de la Ciencia (Science Park) and the Centro Cultural Memoria de Andalucía (Memory Cultural Centre of Andalusia), essential focal points created as places of interaction due to their social, cultural and territorial context. 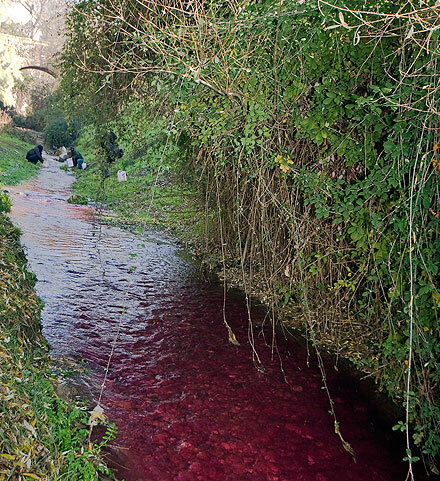 In the itinerary planned for these interventions, water will be the leitmotiv through time and the various cultures, from Sacromonte, going down to the River Darro, and following its course to where it joins the River Genil, to the Centro Cultural Memoria de Andalucía. 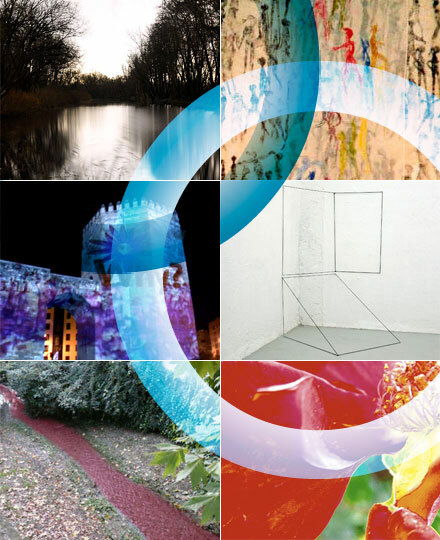 The aim of the SPORA Ephemeral Art Exhibition is to promote a common cultural space , in which contemporary art projects are organised and disseminated to encourage ethical and social values through artistic proposals based on two fundamental lines of research: Art and Nature, and Art and New Technologies. Works of art by the following artists can be seen from 18 to 21 December 2008: Georg Petzold (Germany), Hiltrud Scháfer (Germany), Colectivo Miga (Spain), Noni Lazaga (Spain), Pilar + Amada (Spain) y Teresa Vida (Germany). This Exhibition is the result of the SPORA Project. RESEARCH, CREATION AND DISSEMINATION promoted by the Seminario Permanente de Arte, Ciencia y Tecnología (Permanent Seminar of Art, Science and Technology) of the University of Granada and the Asociación y Grupo de Investigación Arte y Sociedad (Art and Society Association and Research Group). 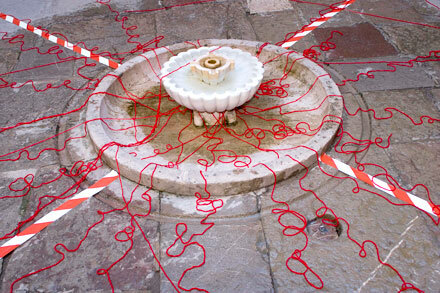 The 1st International Exhibition of Ephemeral Art is the 3rd, or dissemination phase, of the "SPORA PROJECT. RESEARCH, CREATION AND DISSEMINATION" whose main objective is transferring artistic, scientific and technological processes and research results to society. In this respect, the SPORA project is based on an idea that arose from the need to make the synergies that take place in research centres, universities and science, art and technology centres, as well as those that generate new knowledge, more accessible to society. In this respect, the SPORA Project aims to connect people with scientific and technological processes by means of contemporary art practices that use them. The contemporary art proposals we are referring to are multidisciplinary and they help to make these complex processes based on science and technology more accessible to people by using them in contemporary works of art and thus bridging the gap. This channelling of science and technology, which materialises in contemporary works of art, is an enrichment of dissemination principles and approaches, since they add qualitative factors, such as the promotion of social understanding, rapprochement between cultures and a way of understanding the world through science and art. It is a fact that bringing science and technology groups and centres together with art and humanities ones has become a need that emanates from both parties. This is how we can coordinate similarities between the three areas, Art, Science and Technology, which are the basis of the objectives and methodologies for attaining the main aim and essence of the SPORA Project. STRUCTURE of the SPORA PROJECT. This project�s structure is based on a combination of three basic and closely connected actions which, in turn, are implemented in a series of performances. An example of those already performed and those that are in the implementation process is given below. 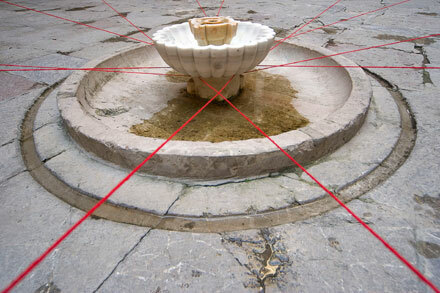 Creation of a stable structure within the University of Granada, such as the SEMINARIO PERMANENTE DE ARTE, CIENCIA Y TECNOLOG�A (Permanent Seminar of Art, Science and Technology), which leads joint projects of Research Groups of Andalusian Universities and Study and Production Centres in Science, Art and Technology. In the SEMINAR, areas of knowledge are related, and workshops, conferences, congresses and events are organised. � "Conferences on Vjing Technology applied to Contemporary Artistic Creation" + Jam session + Conferences + DVD. Collaboration between MIGA, Net Label and the "Art and Society" Research Group HUM 850. Project in the funding process. February 2009. Currently in the call for proposals phase (Continuing Education Centre of the University of Granada). � "Interactive Art Conferences". Collaboration between the Diana Research Group of Virtual Reality Environment Research of the University of Malaga, Prinia Research Group, Virtual Reality and Stereoscopic Immersion, University of Cordova, and Art and Society Research Group of the Faculty of Fine Arts of the University of Granada. September 2009. Sensory Experimentation Laboratory, SPORALAB, which manages the human and technological resources required for the research and production of multidisciplinary and interuniversity creation projects based on interactivity, robotics, virtual reality, sound space, etc. This laboratory has been requested in collaboration with the Parque de las Ciencias. It is in a study phase by the Consejer�a de Innovaci�n (Ministry of Innovation) of the Junta de Andaluc�a. 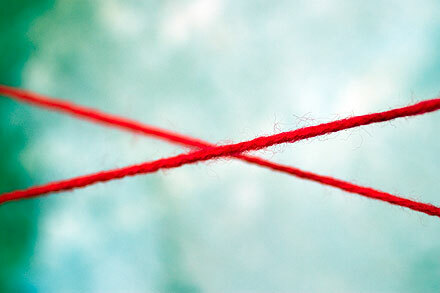 Communication of scientific, technical and artistic processes. 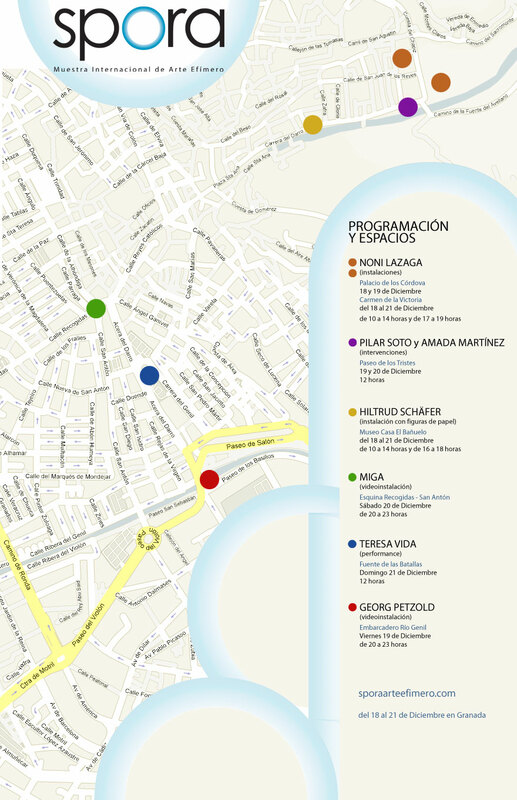 Promotion at a local level of an international exhibition to disseminate the projects performed. 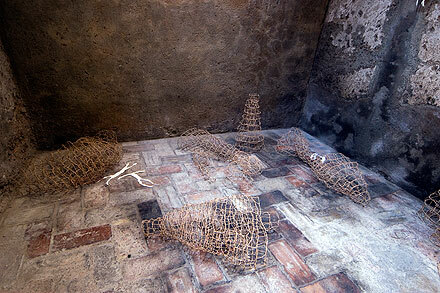 This results in the INTERNATIONAL EXHIBITION OF EPHEMERAL ART. TRADITION AND MODERNITY. It will show work processes connecting art, science and technology and their results in the shape of a contemporary work of art on a public thoroughfare and/or in the most emblematic buildings in the city. Video artist and musician born in 1979 in Karlsburg (Germany). He has been working in his own workshop and studio in Potsdam (Germany) since 2002 and he studied Media Art and Design at the prestigious Bauhaus University in Weimar. His work is based on video art and sound installations and on investigating with innovative video screening and film production methods. His interest in the public space is based on the connection between the notion of movement and the dynamics of natural and unconscious processes. Furthermore, he produces and composes at an international level for the Campy Capstan electronic music project. "A breath vibrates on the water/Un aliento vibra sobre el agua". Knowledge of water as an asset and man´s relation with this resource are demonstrated so as to understand that it is not permanently available. When the threat of losing it looms, people´s understanding of how sensitive and complex our Ecosystem is increases. 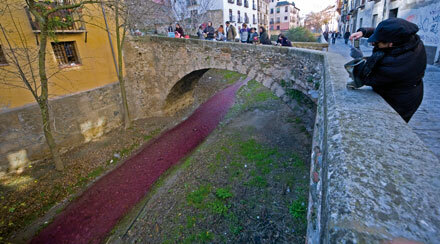 The artist´s objective is to make us more aware of this fertile asset and to get the public to pay more attention to it. With the work "A Breath Vibrates on the Water", this search will be represented together with a spectrum of subjects, such as the environment (ephemeral nature), society and responsibility. And these, in turn, will be approached through a unique aesthetic representation. Georg Petzold´s scenography, despite the fact that he does not adopt a performative character, stars a grandiose actor: water. Water and the river bank in Brandenburg in Germany were filmed throughout an entire autumn day this year. 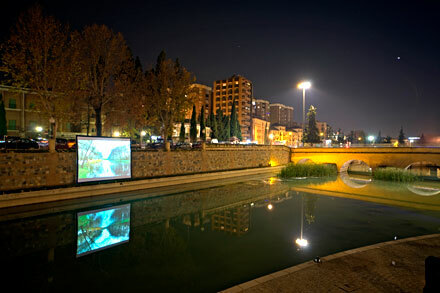 The film´s material is then manipulated by the artist as a filmloop and, in turn, it will be shown near the course of another river in Spain. 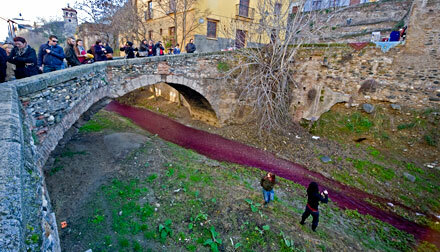 With this installation the artist will represent an idyllic landscape with an intense colour near the bridge over the River Genil in Granada, whose location was built solidly and isolated from these natural enclaves. The video´s sound comes from the depths of the natural environment, but it will unfold in the spectator´s imagination. The entire installation will consist of the perception of nature and reality together with the discovery of the perception of the senses, which the artist will interpret in a new fashion in the context of an urban world. As a result, he refers us to a global action / reaction to the problems existing in the natural environment caused by man�s exploitation and the planet´s subsequent geological and physical decline. Water, which could be seen as an absolute and valuable material, will be a transparent configuration and the subject of a hyper-real memory in a video and sound installation. The artist´s expression is not, therefore, considered to be a scientific theory, but rather a vibrant contemporary perception of art. A German artist and lecturer at the University of Osnabr´ck since 1973. She has been known internationally since 1988 for her experimentation with paper manufacturing techniques using natural fibres. She is a specialist in handmade paper manufacture techniques, including Japanese and other oriental techniques. She has exhibited her work on numerous occasions and she has won several prizes and awards, such as first prize at the 4th International Paper Triennial in 2002 in Switzerland. Her most recent work shows concern for the function of art in public life, and this concern becomes more intense as her work develops. 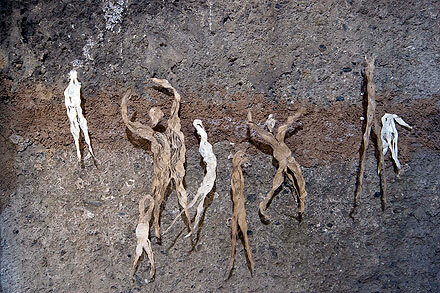 Her installations demonstrate a clear reference to organic matter, death and the dematerialisation of the body. Her three-dimensional creations search for volume in the delicateness of paper fibre, with which they have a skin-like quality and receive a treatment that is clearly related to the great universal masters of painting. From 18 to 21 December (10:00-14:00, 16:00-18:00 hours). 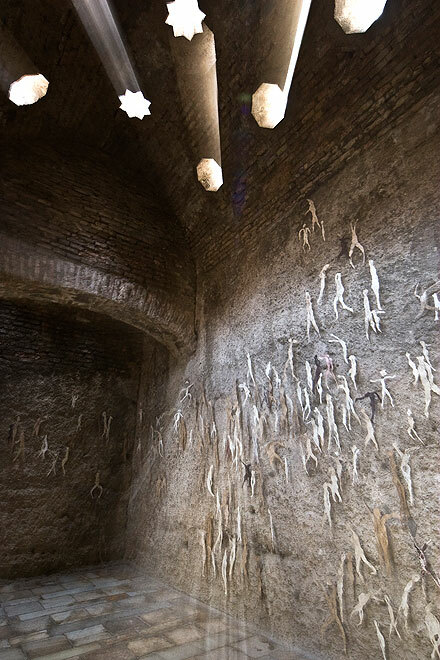 A countless number of figures with a human shape hanging from pins on walls move along a line through the wall: shadows of the figures, shadows of human beings that once visited this place (a former Arab baths), leaving their mark. The light from the lanterns that visitors receive on entering the Granada Baths bring these figures to life for an instant. They follow visitors for a few seconds, leaving behind their elongated shadows, reminding us of their former existence. -Traces. On the one hand, the transitory aspect is highlighted by the material itself: kozo, a Japanese fibre made from the mulberry tree. On the other, these figures remind us of the ephemeral quality of life. 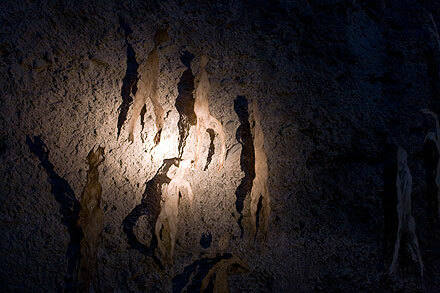 Spectators experience an association with our ancestors´ cave paintings, traces of the past. 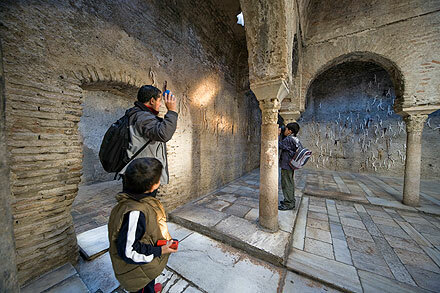 This exhibition´s location in a former Arab baths (traditional architecture), which places special emphasis on History, on the traces of history, on tradition and on our duty to respect and preserve the history we have in common. A second small independent installation on the floor shows some bundles shaped like buds, fragile objects made from paper fibre, closed, apparently open, broken, incomplete. They show another side of a process similar to the one expressed in the installation on the walls: absence of a living figure, of something that once had life, of something ephemeral. These objects evoke an association with transformation, with metamorphosis. 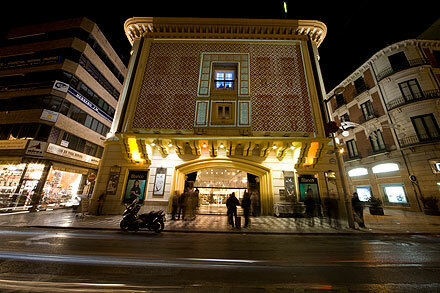 A group of audiovisual creators formed in 2004, established in Granada, and which gathers together projects by artists connected with experimental video, net art, sound space and Vjing technologies applied to contemporary artistic creation, among others. Besides individual works, they are presenting a collective work in Spora by N�ke� (Vjing, animation, MIDI, photography), Decolora (video creation) and Intelec (sound art). Their audiovisual label www.miga-label.org, with free downloads and free distribution, is in tune with its founders´ creative need, as well as a new form of thinking and acting in the face of closed music markets, since they perform the entire production and promotion process, which gives them total creative control over the references exhibited. www.animatek.net, a webzine managed by Miga, gathers together contents based on information on digital culture, electronic music, other groups´ activities, new copyrights and copylefts and music or video creation festivals. It also has an open opinion forum. 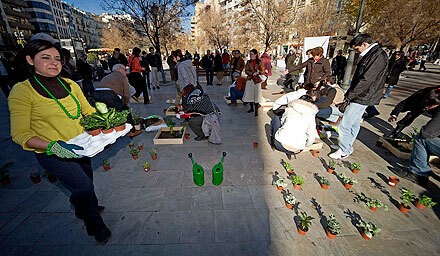 It serves as a medium for disseminating activities throughout Spain, and especially Andalusia. Facade of Caf� Aliatar (Corner of Calle Recogidas and Calle San Antón). The architecture of a building as a screen, video as a creative connection and sound as a source of dissemination. Audiovisual pieces created from sequencing, synchronising and studying space, using loop as a starting point, in both image and in the sound field. The city as a new context for investigating other viewpoints and other concepts. An artist from Madrid with a PhD in Fine Arts. In recent years she has been interested in space, perception and the void. She works with various techniques and materials: paint and especially installations. In her installations, she investigates ephemeral constructions made with wool, entitled space events. 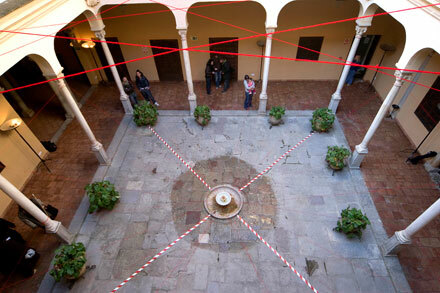 Exhibited in 2007 in the Amparo Gamir gallery, there is a direct interaction with the public´s perception of them, force fields and the architectural space in which they take place. She is an expert in oriental fibres and has worked in recent years with gampi, mitsumata and kozo. She has lived for long periods in different countries, such as Egypt and Japan, where she was given grants to carry out various studies. This research led to the publication of two books: "Washi, el papel japon´s" (Washi, Japanese Paper) (Editorial Clan, 2000) and "La caligraf�a japonesa. Origenes y relación con los movimientos abstractos occidentales" (Japanese Calligraphy. Origins and Relation with Western Abstract Movements) (Editorial Hiperión, 2007). In the artistic field, she has been exhibiting since 1989, participating in numerous exhibitions in Spain and abroad. Among others: Museum of Fine Arts in Alexandria (Egypt), Paper Museum (Mino, Japan), Metropolitan Museum (Tokyo, Japan), ARCO (Madrid, Spain)� One of her most noteworthy pieces made for public spaces is the last one, recently opened in the main post office of the Palacio de Comunicaciones at Cibeles in Madrid. 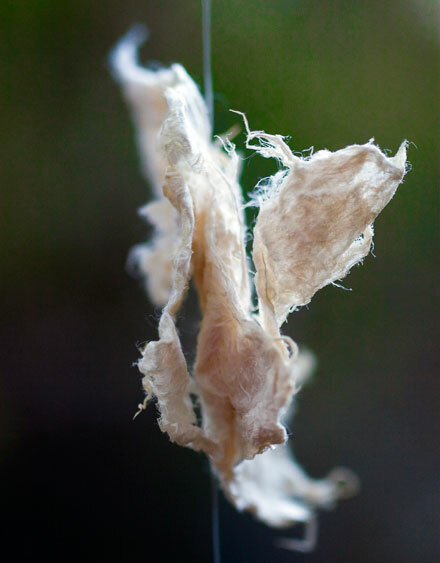 In the last ten years, she has been working with pieces and installations that interact with the various spaces where they are located and she has been especially interested in oriental paper and fibres, as they are versatile and because of their connection with nature, and she later wrote a book about them. Within this context, and via these same cultures (Arab and Japanese), she became interested in the spatial meaning of the active void in both through calligraphies. One of the conceptual challenges that has marked her work has been to make the invisible visible, such as drawing in the air, treating it as a solid and not a gaseous medium. Similarly, she has also worked with hypothetical planes in space created through force fields that give each piece its character. The material chosen had to be simple and elastic to be able to move through enormous areas, which is why she chose air and wool, almost non-existent and virtually ephemeral, but with enough force to evidence the value of a line that is sometimes capable of going through walls. Carmen de la Victoria (Cuesta del Chapiz). From 18 to 21 December, from 10:00 to 14:00 hours and from 17:00 to 19:00 hours. 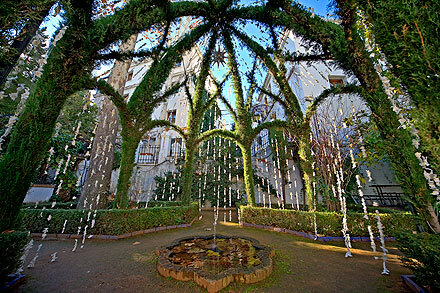 She has used the void of the architecture of a pergola made of cypresses in the Carmen de la Victoria. Some abstract calligraphies created with kozo fibre float in the empty space. The fibre has been extracted from inside the branches of a Japanese tree of the mulberry family, which is normally used to make paper. The plant essence of the architectural structure is the same as that of the calligraphies. The idea is to create a spatial, almost dreamlike, poem, in which the nature of the site blends with the new shapes created by the oriental material. Palacio de los Córdova (Cuesta del Chapiz). Using the architecture of the central courtyard, she is interested in connecting the various unmovable architectural elements by almost imperceptible lines in space. Modulating empty spaces and making something invisible visible. Andalusian artists who work individually as well as together. They are multidisciplinary artists who base their creations on interventions in public, natural or urban spaces, with an artistic practice that again focuses on the direct relation between art and society, creating a type of art that is more accessible and permeable for society. They use various means of artistic expression as a tool to perform their projects. Video, sound and photography, as well as the material remains of their ephemeral interventions, are documents that depict the action with which they create their works. They have participated in numerous exhibitions and competitions individually and together. 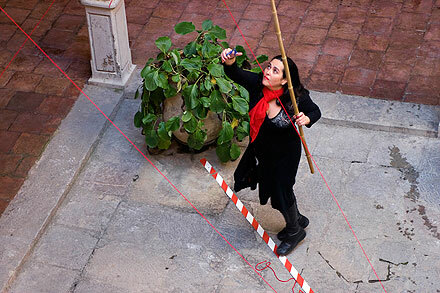 Pilar Soto has participated in numerous exhibitions, as well as competitions and artistic events, such as ARTFUTURA, in the 2nd Exhibition of Experimental Art in Granada, in the Landscaping Festival of the Creation of Exteriors in Spain, the Cultural Project "Hitos del Rodenal" and in Fase I (Phase 1). Concha Márquez Foundation in Guadalajara. Her work as an artist in these events has been with interventions in nature and installations with sound. "Vidas Recicladas / Recycled Lives", made out of recycled paper, is a work of art that questions society's lack of ecological conscience, valuing the importance of paper as the result of the death of a living being, the tree. 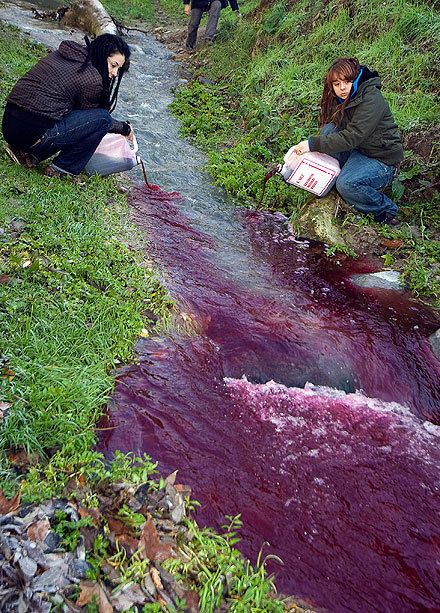 Or the intervention in nature, screening and creation of the work "El Ritual / The Ritual", created in conjunction with her sister, Verónica Soto, a permanent work of art that encompasses reflection on nature´s place and importance in view of its destruction at the hands of humans. Amada Martínez bases her work on specific actions that materialise in installations with the aim of creating by using the location as a support, turning it into a �visitable� work. The general objective in her artistic production is to give these spaces life before their death, to create a work of art that is active in its urban and social environment, making us think about the city, its composition and the various states spaces earmarked for construction go through. On 19, 20 and 21 December at 12:00 hours. An attempt to show the behaviour of nature vis-�-vis the city, with a poetic connection, has resulted in "Tramo Visible". 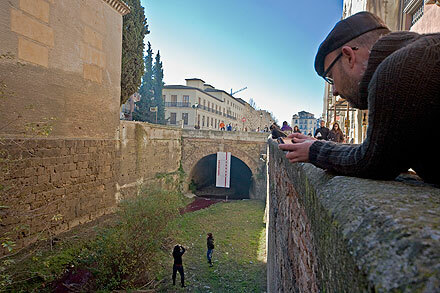 This is an intervention that lays claim to the importance of natural spaces in the city and, specifically, the underground course of the River Darro through the city of Granada. We use the visible part of the river as a place of intervention. 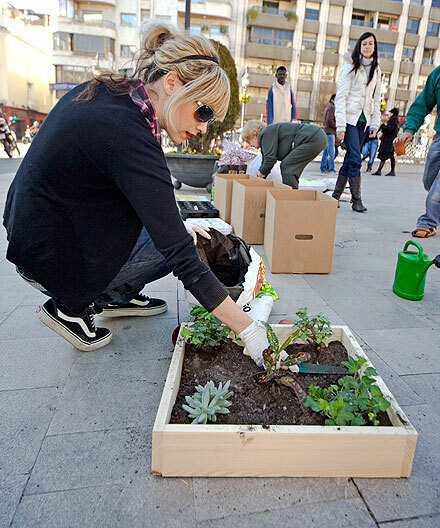 The aim is for the natural space to be appreciated, making people aware of its immersion in the urban space. 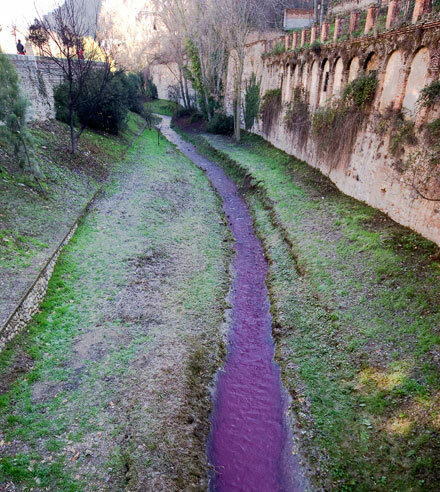 Dyeing the river is an ephemeral action that clamours for the attention of passers-by for an instant, thus attaching an importance to nature in the urban space and its coexistence with it. A visual artist who has been creating public art in connection with nature since 2001. Works such as "N-art: como lenguaje, desde la naturaleza, y para lo social / N-Art: as a Language, from Nature and for Society", "Nature´s Light", "Green Square Extension", "I´m an Actor", etc. have all demonstrated this. 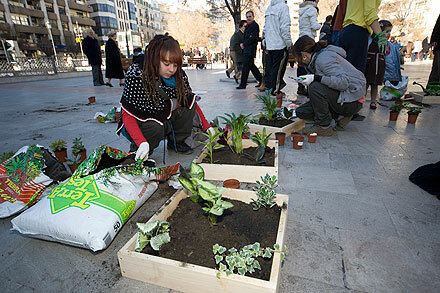 The action "Green Square Extension" was performed in Granada in 2003, in which she demanded the creation of more green areas in the city. 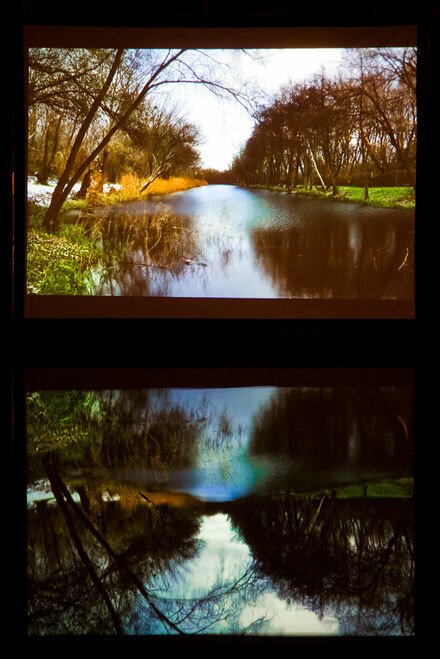 In the work "Ver�nderung deine Wahrnehmung / Changing Your Perception" performed in Weimar (Germany) in 2004, by means of colour frames, she proposed another view of the natural perspective. 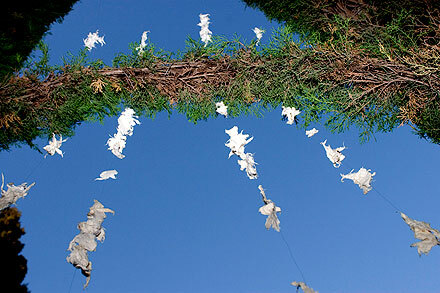 In her last performance in 2008 entitled "Es más fácil recordar que olvidar / It is Easier to Remember than to Forget", she created a line with wild white flowers on a bridge in Austria. Fuente de las Batallas - Acera del Casino. Sunday 21 December at 12:00 hours. Mankind has colonised the natural environment. Our impression of it is that it does not exist or that it is hardly ever enjoyed in the urban context. Pure nature is outside the city and it is domesticated within it. Nature cannot be anywhere, since we tell it where it has to grow. 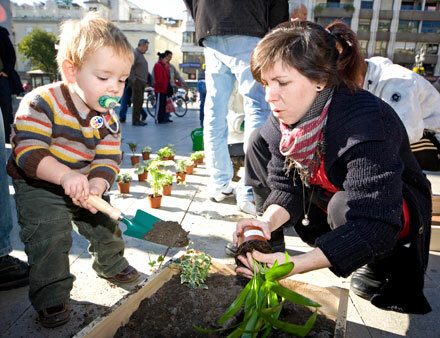 Planting in the centre of the city is not possible, since our asphalt is solid and permanent, but creating fleeting gardens, which surprise passers-by, is possible. They can then enjoy integrated green spaces as they walk by. - sporadic gardens. 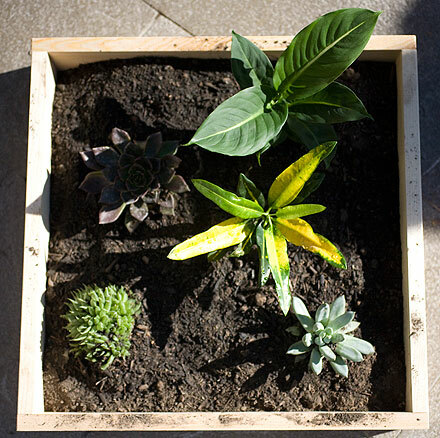 For one day, let´s imagine a city where nature is an element found at ground level, portions of garden installed throughout the city centre remind us of nature. 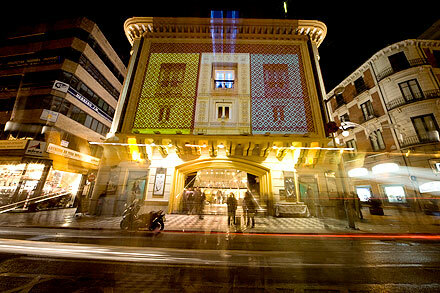 - Facultad de Bellas Artes "Alonso Cano" (Faculty of Fine Arts) of the University of Granada. - Ministerio de Cultura (State Ministry of Culture). 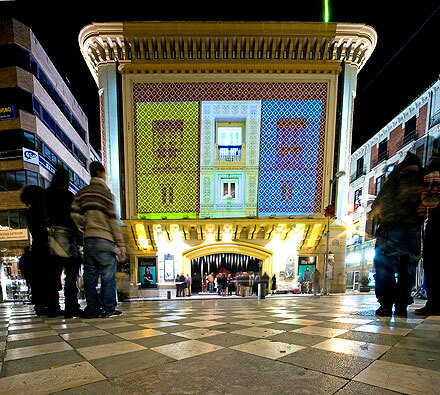 - Consejería de Cultura de la Junta de Andalucía (Ministry of Culture) of the Junta de Andalucía (Government of the Autonomous Community of Andalusia). Dirección General de Museos y Arte Emergente (Directorate-General of Museums and Emerging Art). - Ayuntamiento (City Council) de Granada. Concejalía de Cultura (Department of Culture). - Consejería de Innovación, Ciencia y Empresa (Ministry of Innovation, Science and Business) of the Junta de Andalucía. CADE. - Oficina de Transferencia de Resultados de Investigación (Research Results Transfer Office) of the University of Granada. - Centro de Cultura Contemporánea (Centre for Contemporary Culture) of the Vicerrectorado de Extensión (Extension Vice-Rectorship) of the University of Granada. Management and Commission: Dr Ana García López. Lecturer and Vice-Dean of Institutional Relations of the University of Granada.